This class is the NRA Basic Shotgun Class. 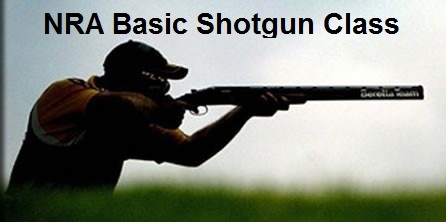 This teaches students the knowledge, skills, attitude for the safe and proper use of a shotgun in shooting a moving target. This class includes classroom and range time. The students will learn how to shoot moving targets. Students learn NRA's rules for safe un handling, shotgun parts and operation, shotgun shell components, shotgun shell, malfunctions, shooting fundamentals, range rules, shooting at straightaway and angled targets, cleaning, etc. Students will receive the Basics of Shotgun Shooting Handbook, NRA Gun Safety Rules brochure, Basics of Shotgun Shooting Student exam, course completion certificate, etc. You will need to bring a shotgun, 2 boxes of shells, hearing protection and eye protection. I can provide a gun and ammo for an additional charge.